Moritz Putzier is a new name on the German design scene who is already inviting substantial attention for his ‘designs with a twist’. 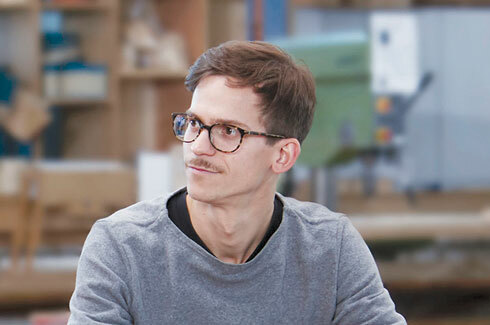 At 30, product designer Moritz Putzier already has a few awards to his name. Born in Munich in 1986, Putzier studied at the University of the Arts, Bremen following which he opened his own studio in 2014 in Bremen. 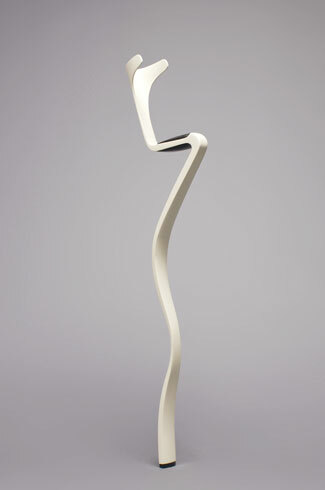 In the few years since, his work has been focused on creating designs for lighting, furniture and product design. He has won the Design Plus Award, the Pure Talents Contest Award and was a finalist for the 2016 German Design Award. Putzier’s design philosophy is slanted towards connecting “reduced shapes with natural materials often showing a small technical sophistication.” There’s a little twist, a “hidden aesthetic” that showcases an attention to detail. Putzier’s product designs have this in spades. 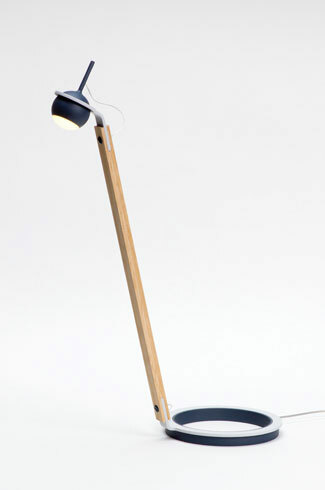 One of his earliest designs is ‘Plywood Companion’ (2011), a walking aid that looks unlike any cane you have seen before. The idea behind the curving strip of moulded wood was to give it a unique shape and “take away the usual medical character” and make it more attractive. The design “achieves high stability with low thickness” which also gives some way under pressure, making it comfortable and not rigid. Depending on the user’s weight and requirements, the thickness of the wood can be customised. 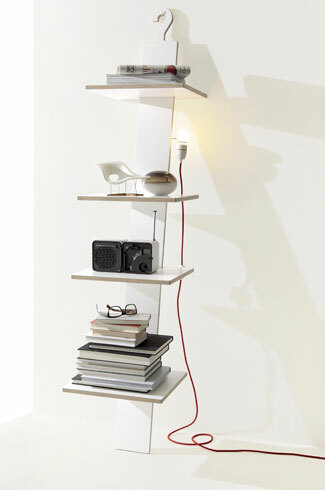 The HangUp shelf (2013) is similarly flexible, changing itself to adapt to its surroundings. It is a flexible storage solution with four different types of shelves (including a tray shelf) with a large hook at the top, which in itself is an integral part of the design. There’s also a metal spiral to attach a light bulb. 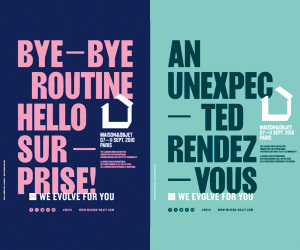 Two of Putzier’s graduation projects attracted attention from the international design world. The Cooking Table (2014) is a trestle table with a solid oak top and looks like any regular table but here’s that elusive twist. The table top is actually two separate halves joined together at the centre by a hidden track that houses movable gas burners made of brass. When the centre track is closed, the table can be used like any other surface, making it a wonderful space saver for a modern apartment. 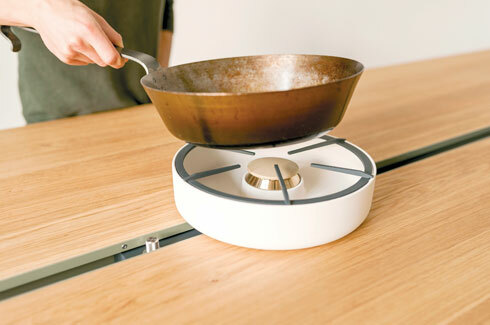 Using the specially designed Vessels (2014), one can cook right at the table, reducing the need to cook and eat separately. The porcelain Vessels, on the other hand, also have a dual function. 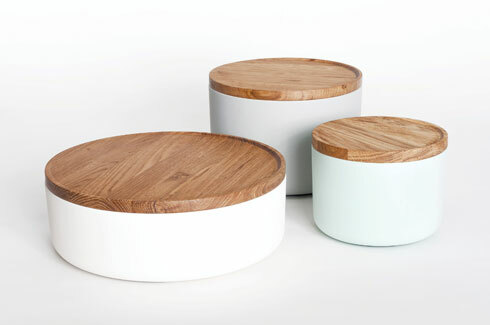 Their solid-oak lids double up as cutting or serving boards. The vessels can be used to both cook in or for storage. They are elegant enough to be serveware. Putzier won the Pure Talents Contest at IMM Cologne 2015. The Cooking Table is accompanied by the Stoolbench, a playful merger of an elevated stool with a bench. The high, slim seat makes it ideal for any kind of activity at the table including chopping vegetables. 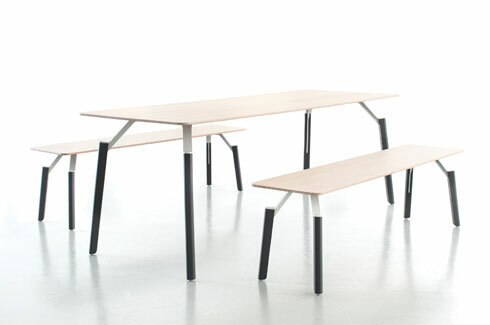 In 2015, Putzier designed the Levo bench and table. The powder coated steel furniture has a solid Pollmeir beech top (laminated veneer). What distinguishes this set besides its unusual leg design is its “discontinuity”. According to Putzier’s website, the name Levo, comes from the Latin for “I elevate”. The bottom half of the legs of both the table and the bench are made of opaque beech veneer while the top parts are fine metal. As a result, the table and bench tops appear to float, giving the piece of furniture its name. The Inti lamp (2016) is inspired by how the moon orbits the earth and how its silhouette changes depending on its phase. 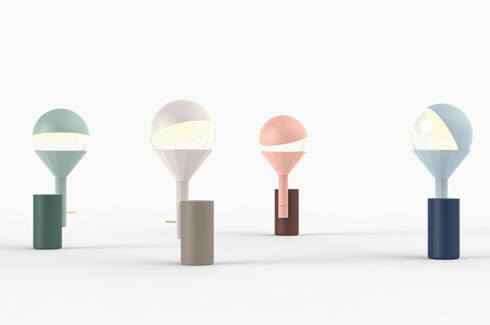 The lamp has two parted glass spheres – one transparent, one coloured. “The sphere is positioned on a funnel-shaped object that emits light. By turning the sphere manually the light is reflected through the coloured half in different angles. This way, it’s very easy to create various light situations with one simple mechanism — from a very brightly lit room to a cosy dimly lit one,” explains Putzier. 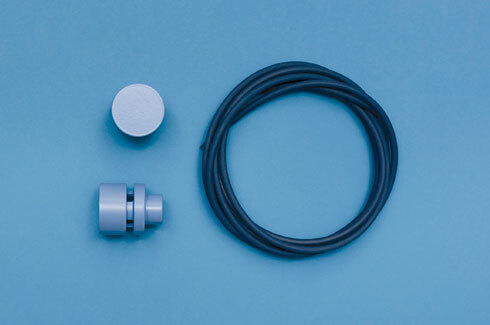 Putzier has also invented the Cluster Dots (2015), a super-simple storage installation consisting of merely powder coated ‘dots’ and a wire that holds things in place. The uses of the Cluster Dots can be as varied as per the user’s imagination. Apart from furniture and lighting, Putzier has also designed the interiors for the lobby at Theatre Bremen. 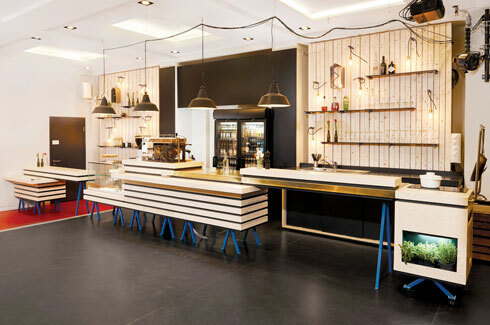 ‘Noon’, as it is called, is a multi-functional space which is used as a coffee shop during the day, a space for theatre guests in the evening and as a disco in the night. Three uses for one space – now that’s design with a twist!